Bethesda Softworks is holding a Fallout: New Vegas sweepstakes, featuring a grand prize that includes a trip to the New Vegas launch party in Las Vegas and an invite to Kim Kardashian's 30th birthday party. Fallout: New Vegas is just a few weeks away and that can mean only one thing: It's time for a contest! And this one is about as easy as they come. Just hit the Fallout: New Vegas page on Facebook, then click the big orange button that says "Play Now!" 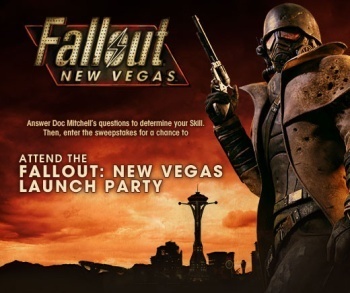 You'll run through a Fallout 3-style series of questions from Doc Mitchell that will determine your best skill (mine was speech, which is actually an accurate reflection of my "real" Fallout style) and then you'll have the chance to put your name in the hat. That's it! And what's up for grabs? Nothing less than a trip for two to the Fallout: New Vegas launch party on October 16 that takes place at the Palms Hotel and Casino in lovely Las Vegas, two nights hotel accommodations, $300 in cash, a copy of the Fallout: New Vegas Collector's Edition and - I wasn't kidding about this - an invitation to Kim Kardashian's 30th birthday party at the Tao Nightclub! First prize includes the trip to Vegas and the New Vegas CE but no invites to anywhere fun, while three second-prize winners will take home an Xbox 360, 1600 Microsoft points and the game, and 100 third-place finishers will get New Vegas t-shirts. As usual, the contest is only open to residents of the U.S., so while you can still answer the questions and post your results to your Facebook wall, you can't actually win anything. Because I share your pain, and because I can't for the life of me fathom what Kim Kardashian has to do with any of this, I'm holding a contest of my own: Whoever can come up with the best explanation for her presence wins kudos from me! It may not be much of a prize, but hey, at least anyone can win it. Fallout: New Vegas comes out on October 19 for the PC, PlayStation 3 and Xbox 360.